Australian potash developer Kalium Lakes has secured an additional AU$20.8 million in funding for the Beyondie project. Australian potash developer Kalium Lakes (ASX:KLL) has secured an additional AU$20.8 million in funding for the Beyondie sulfate of potash (SOP) project. The multimillion conditional cornerstone investment from UK-based private equity fund Greenstone Resources will be used to further advance the potash mine in Australia’s Eastern Pilbara region. The company was granted a trading halt on the ASX ahead of the news, which expired upon the release of the investment announcement. For its contribution, Greenstone Resources will receive a 19.99 percent stake in Kalium Lakes. “Securing a cornerstone investment partner of the caliber of Greenstone will allow Kalium Lakes to continue its momentum to achieve Australia’s first commercial SOP production next year,” Brett Hazelden, Kalium Lakes’ managing director, said in the press release. Kalium has also received hefty investments to develop Beyondie from the Northern Australia Infrastructure Facility (NAIF) and German bank KfW. “With this key equity placement and terms recently agreed for debt funding of up to AU$74 million from NAIF and AU$102 million from KfW, our project financing pathway is now clearly identified,” said Hazelden. Kalium has earmarked the cash infusion for the purchase of long-lead items, pond construction, bores, trenches, pumping equipment, accommodation village installation, a Royal Flying Doctor Service airstrip, administration and workshops. Greenstone was established as a private equity fund specializing in metals and mining in 2013, and has invested in a variety of projects since its inception. 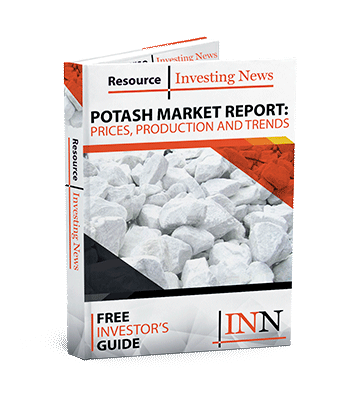 The private firm said it is excited to invest in Kalium, viewing the move as a chance to get involved with the first independent potash producer in Australia. It’s been a busy few weeks for Kalium. Last week, the company announced the signing of a binding offtake agreement with German fertilizer producer K+S (ETR:SDF). The deal will see Kalium supply K+S with as much as 90,000 tonnes per annum of SOP from Beyondie. Kalium expects to bring in AU$650 million in revenues over the life of the 10 year deal. Shares of Kalium Lakes were slightly down on Wednesday (April 3), trading at AU$0.50.